I wasn’t sure I would love this book. On the pro side, it’s historical fiction about a dramatic, tragic event. It’s written by Alice Hoffman, who’s terrific. Though her books can be uneven, she definitely knows about writing strong female characters. And finally it’s about Jews in Israel. My father tells me all the time that I need to visit Israel, and now I have even more incentive. I love reading about historical places and events and then visiting them. After reading the first chapter, I was worried that the writing style might turn me off. It’s on the poetic and dramatic side, and (as the reviews on Goodreads will tell you) this will either make or break the book for you. I tend to like writing that’s a little more straightforward. They say the truest beauty is in the harshest land and that God can be found there by those with open eyes. But my eyes were closed against the shifting winds that can blind a person in an instant. Breathing itself was a miracle when the storms came whirling across the earth. The voice that arises out of the silence is something no one can imagine until it is heard. It roars when it speaks, it lies to you and convinces you, it steals from you and leaves you without a single word of comfort. Comfort cannot exist in such a place. What is brutal survives. What is cunning lives until morning. This is a book about the Roman siege at Masada in about 70 A.D. Jews have been fleeing the Romans all over that part of the world, and a handful of families have found their way in the last remaining stronghold. The story is told from the perspective of four women: Yael, Revka, Aziza, and Shirah. Each of these women have a different story to tell, but their stories merge at Masada. In case you’re wondering, the events of the story don’t repeat four times — each narrator tells the story in chronological order as well as their back story. Of the four stories, I found the first character to be the hardest read. Which is unfortunate because you MIGHT put this book down and never get to the other three. Yael is a strong woman but her story is less interesting, and she’s less sympathetic. 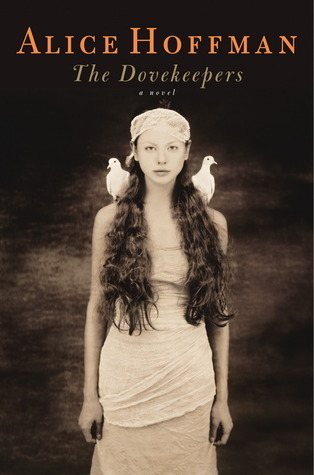 My favorite character was Aziza, and I loved where Hoffman takes her story. There is a ton of historical and religious detail in this book, and like the language, this will make or break the book for you. I loved it. Reading about dovekeeping in ancient Israel was surprisingly interesting, and it was also interesting to read about the religious rites and ideas that are so different from how I think of Judaism today. Like books about other historical disasters, like Pompeii or Titanic, this book has built-in drama – you know what’s going to happen, but you’re still caught up in how these characters will experience it. It takes skill to make a story this compelling when we know how it ends, and Hoffman does it perfectly. I was on the edge of my seat. I was really glad Hoffman includes an epilogue that explains some of her research and the historical details. There were aspects of the ending I didn’t think were realistic – until I read they are actually historical. It’s important to me to know what’s historical and what’s fiction. Like a lot of Hoffman’s books, there’s a fair amount of mysticism in this book. It’s well done and I liked how Hoffman weaves it into the culture and religions of the time. For example, one of the characters gravitates towards iron, and another to water, and their personalities are driven by this element. Everywhere I walked my fate walked with me, sewn to my feet with red thread. All that will ever be has already been written long before it happens. There is nothing we can do to stop it. I will say this book fueled my ongoing argument with the husband about ancient Rome. I see bloodthirsty and cruel, he sees brilliant and powerful. He says all great empires are cruel, I say the Romans were extreme. He says the Romans did a good job of integrating other cultures and religions; I say a culture that only lets you live if you give up your beliefs and your freedom is not “integrating other cultures.” And so it goes. We’re both right, I suppose, I’m just more creeped out by things like crucifixion and gladiators than he is. Seeing the Coliseum in Rome a couple of years ago made me kind of sick. I’ve already recommended this book to family and friends. It’s not an easy read, or a short one, but definitely worth the effort. This book meets the TBR Pile Challenge and the Around the World Challenge. I do sometimes think Hoffman straddles that thin line between contemporary fiction and chick lit, which is maybe why I haven’t read anything of hers for quite a few years despite having a few in my TBR… maybe time to dust some of them off and give her another go…. I always wonder about Hoffman’s premise(s?) <–weird word. But I always end up loving them. I have this one waiting on my ereader. One day, one day.